In Hawaiki, Houmaitawhiti and his sons Tamatekapua and Whakatūria became involved in a skirmish with the chief Uenuku, who was suffering from a boil. When Uenuku witnessed Houmaitawhiti’s pet dog Pōtaka Tawhiti eating his discarded bandage, he killed the dog and ate it. This was because according to traditional beliefs, the dog’s action was akin to eating Uenuku himself. In retaliation, Houmaitawhiti’s sons stole fruit from Uenuku’s tree. Warfare ensued. One son, Tamatekapua, looked to the sea’s horizon and decided it was time to leave. He built a canoe, chose a crew and sailed off, heading south of the setting sun. Houmaitawhiti, his father, stayed behind in Hawaiki. 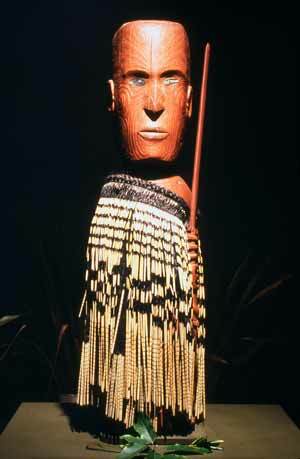 This carving is of Houmaitawhiti.